In Lara Vapnyar’s novel, Still Here, four immigrant friends are living in New York and discuss their lives, their dreams, their successes, and their failures. One friend, Sergey, develops a phone app called “Virtual Grave” in which a person’s online presence is preserved after the person has died so that friends and family can call in and feel connected to those who are gone. This spurs much debate between the friends on how our on-line lives define who we are, and what it means to die in a world where we leave a digital trail that does not completely disappear. I found this book to be mostly quite unremarkable. We all have struggles throughout our lives, and while I understand that the struggles here are different, in large part because of the ‘stranger in a strange land’ aspect, the struggles aren’t any more difficult than those that my friends or I face on a daily basis – just different. So if the struggles don’t grab me and make me want to read to see how the characters handle it, it must be the characters who drive the novel. But these characters don’t resonate with me. Clearly I can’t relate to a group of Russians struggling to survive in New York. But I wasn’t sure why I needed to. Nothing about this story drew me in. The most interesting concept was the development of the phone app, but this, too, falls flat as it serves its purpose to parallel the themes presented by the characters. Looking for a good book? 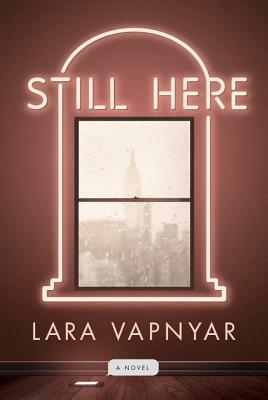 Still Here by Lara Vapnyar is a plodding story of Russian immigrants in New York looking for meaning – you might be looking for meaning in the book. I received a copy of this book from the publisher, through Blogging For Books, in exchange for an honest review.